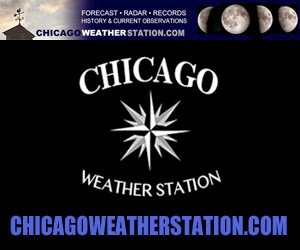 Far north Chicagoland usually gets cooler weather before the rest of Chicagoland. Weather systems slide down over Lake Michigan waters with less resistance than inland locations. Often weather systems hold up north -- leaving Waukegan cold with overcast or fog while Joliet enjoys mild temperatures with sunshine. The northwest suburbs are close enough to the lake get some lake warmth on cold nights. Temperatures in far northwest suburbs usually drop more than near northwest suburbs on cold nights. In summer, the near northwest suburbs are more likely to get some cooling effect from Lake Michigan on hot days. The southwest suburbs are often the warmest communities in early spring, late Fall, and during hot summer days. Many weather systems often border near Interstate 80. Forecasters often define snow storms or severe weather as being either north of I-80 or south of I-80. Interstate 80 is sometimes greatly affected by strong north/south or south/north winds -- affecting high profile vehicles. Fog or smoke from brush fires also affects I-80, perhaps a little more than other expressways, tollways and interstates in Chicagoland.